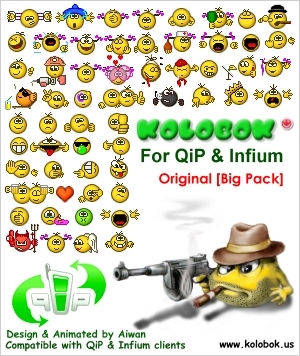 In our archive appeared the new set of smileys KOLOBOK For QiP. Original [Big Pack]. I was asked many times to make this set, but I had no time for it. Now it's ready, you can download it and give references even to those, who can only play solitaire and write texts on computer. The archive is selfextracting, you only need to point the folder and it will decompress itself in the QIP-directory on default. This set contains about 100 smileys expressing the basic emotions as well as special emotions for ladies. I hope, it will be good for both, male and female Internet users, and will help them understand each other. There are only koloboks for light background in the archive. If you like it, I’ll may be do the same for the dark one. Render time: 0.1278 sec, 0.0030 of that for queries. DB queries: 20.